A quick photo of Rick Crozier with this North Saskatchewan River beauty before being released. Every spring at ice out large pike work their way from the deep wintering holes to the creeks and oxbows where they will soon spawn. As they make their way up and down the river the huge egg bearing females keep to the shallow quiet water close to shore well out of the main current. This is where we have fished them for decades using a frozen minnow and a sliding sinker on an open bail set. These fish make great pictures but that’s about it, they are roe bound and lethargic giving up easily when caught. Each fish represents a million more pikes so handle them gently never holding them horizontally bowing the spine, keep the fish vertical for a faster release. 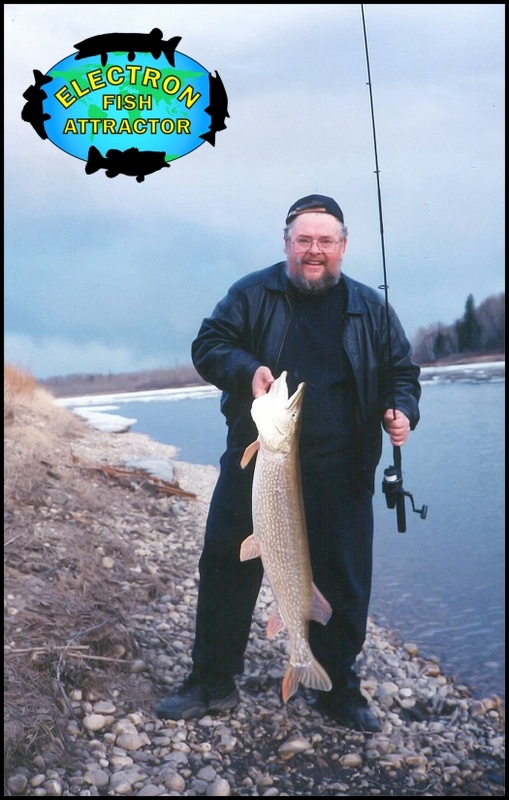 Don’t even think of eating any fish from the North Saskatchewan River! Natural mercury enters the food chain high in the Rocky Mountains by way of bacteria. This is collected in the food chain by natural predation until finally it collects in the fish. Each year a fish lives in this environment it collects more mercury, an old female pike would be so toxic she couldn’t be safely used as fertilizer. Our government has studied this natural contamination in depth in the 80’s and knows full well the danger, yet they still allow fish retention on the river.